SOLD SOLD SOLD!! Large 1 Bedroom Wooden Chalet For Sale On Camping Almafra Caravan Park In Benidorm, Costa Blanca, Spain. Situated On A Highly Desirable Lower Priced Pitch At Just €3,000 Site Fees Per Year! This Chalet has recently been treated / re-sealed and has double glazed PVC windows installed. All furniture is included in the sale and is ready to move into. SKY Dish and all connections in place to connect to a Freesat box or SKY box. Spacious open plan Kitchen / lounge. The large kitchen comes complete with integrated hob, extractor, fridge freezer & washing machine. Gas combi-boiler providing hot water throughout. Good sized Lounge complete with 2 armchairs, dining table & 2 chairs, coffee table, gas fire, wall mounted TV. Air-conditioning installed. 1 large master bedroom with double bed, 2 large wardrobes, drawers, bedside cabinets. Originally 2 bedrooms but converted to 1 large bedroom. Could easily be changed back if needed. Shower room with full size shower cubicle, toilet & sink. Large entrance hallway with overhead storage space. Decked area to the front entrance with space for a small table & chairs to enjoy the surrounding mountain views. Private driveway to the side. 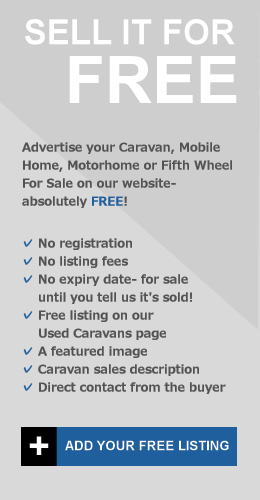 Cheap site fees at just €3,000 per year! Interested In This Chalet? 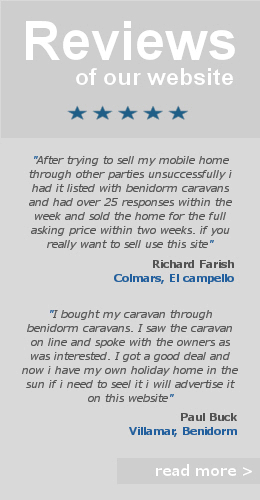 Contact The Seller Directly By Filling Out The Contact Form Below..
Benidorm Resale Holiday Homes | Resale Holiday Homes In Spain | Camping Almafra Caravan Sales.